MATCh is now accepting applications at match.mekongbiz.org until end of December 2017. Startups and agritech solution providers from around the world can join forces to transform the Mekong region’s agricultural industry into a leading global supplier of “safe and nutritious food for all”. The MATCh: The Mekong Agriculture Technology Challenge Startup Accelerator will support startups in agriculture to develop their products, network and learn from industry players, showcase their solutions, and access markets and funding. 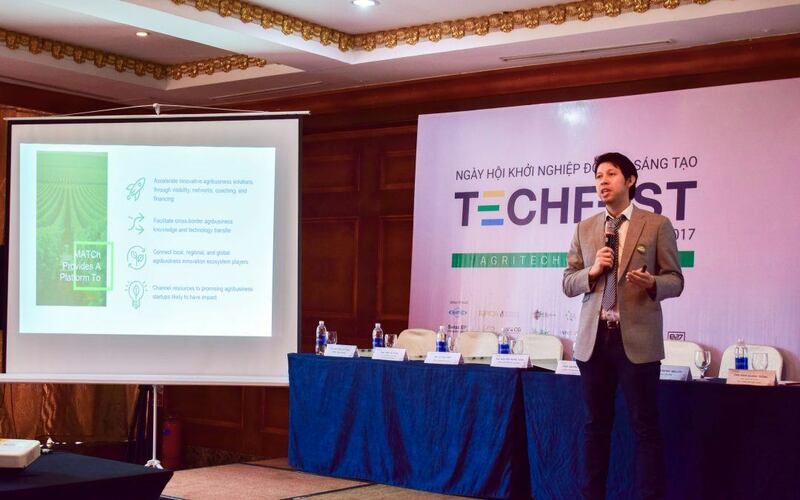 It is aimed at innovative early stage agritech startups and traditional agriculture businesses with new, scalable business models in Cambodia, Lao PDR, Myanmar, and Viet Nam. An additional MATCh Market Access Accelerator will help international agritech solution providers with proven technological solutions expand into the Mekong region. Participants will receive mentorship and assistance with their expansion plans including product adaptation, and forge relationships with potential partners and investors in the region. MATCh will provide awards and prizes to the participants of the final round with winners receiving up to USD200,000 worth of services and in-kind support. In addition, the winners and finalists will also have opportunities to secure investment from strategic and venture investors. Award winners will be showcased at the 2018 Greater Mekong Subregion Leaders’ Summit in Ha Noi, Viet Nam and participate in the Future Food Asia Award Competition in Singapore organized by ID Capital – a co-organizer of MATCh. MATCh is part of a series of innovation accelerators by the Mekong Business Initiative (MBI) which also runs the MIST: Mekong Innovative Startup Tourism accelerator, the SMART City Innovation Challenge Vietnam, and the Fintech Challenge Vietnam. MBI launched MATCh with funding and support from the Australian Government and the Asian Development Bank. MATCh will be powered by the MATCh Alliance, consisting of key regional and local players in the agribusiness innovation ecosystem (See Appendix A). MATCh was also endorsed the six governments of the the Greater Mekong Subregion (GMS) – Cambodia, China, Lao PDR, Myanmar, Thailand, and Viet Nam – at the GMS Agriculture Summit in Siem Reap in September 2017. “MATCh is a great opportunity to enable entrepreneurship and technology to tackle major challenges in the agriculture sector and improve the lives of farmers, protect the environment and respond to new conditions from Climate Change“ said Dr. Pham Hong Quat, Director of the National Agency for Technology Entrepreneurship and Commercialization Development, Ministry of Science and Technology,. “By supporting the innovative business models that this program will create, we can promote efficacy enhancing and environmentally friendly agricultural technologies that also improve farmer livelihoods,” said Dominic Mellor, Senior Economist at the Asian Development Bank and Head of MBI. “MATCh is a great initiative to enable local agriculture companies to work with local and international startups and investors to enhance the competitiveness of the agricultural sector and build value chains of safe foods that can supply both domestic and international markets,” said Mr. Hoang Anh, Vice Chairman of the Digital Agriculture Association. “Future Food Asia, the open innovation platform developed by ID Capital, is partnering with MBI on MATCh because we share a common vision of fostering startup-driven innovations to bring more sustainability to the food system in the Asia Pacific region,” said Isabelle Decitre, CEO of ID Capital. MATCh is now open for online applications at http://match.mekongbiz.org/. About the Mekong Business Initiative (MBI) – MBI The Asian Development Bank and the Australian Government jointly launched the MBI in 2015. The MBI catalyzes private sector development in emerging Association of Southeast Asian Nations (ASEAN) markets, focusing on Cambodia, the Lao People’s Democratic Republic (Lao PDR), Myanmar, and Viet Nam. The program aims to improve the business-enabling environment in these four emerging ASEAN markets with particular focus on business advocacy, alternative finance, and innovation. About the GMS Core Agriculture Support Program (CASP) – CASP supports the GMS in attaining its goal of being a leading producer of safe food using climate-friendly agriculture practices. Now in its second phase since 2012, it is committed to increasing the subregion’s agricultural competitiveness through enhanced regional and global market integration and subregional connectivity. CASP is overseen by the agriculture ministries of the six GMS countries comprising the GMS Working Group on Agriculture, namely: Cambodia, the People’s Republic of China (specifically, Yunnan Province and Guangxi Zhuang Autonomous Region), the Lao People’s Democratic Republic, Myanmar, Thailand, and Viet Nam. Cofinancing is provided by the ADB, the Government of Sweden, the Nordic Development Fund, and the Water Financing Partnership Facility. About Future Food Asia – Future Food Asia is the first-of-its-kind platform for Agtech and Foodtech innovations in the Asia-Pacific. In partnership with multinationals, government organizations, startups and research teams, we are building an integrated innovation network. Operated by ID Capital, it is looking for agile startups to innovate and disrupt our food value chain. The annual Future Food Asia Award ceremony aims to accelerate open innovation in AgriTech and FoodTech across Asia Pacific, with the goal to catalyze and align an ecosystem to cope with the challenges of food.